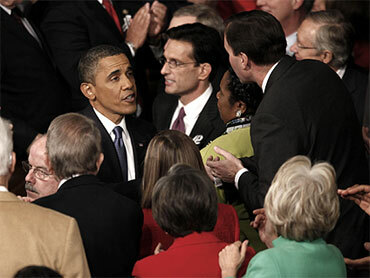 Cantor: GOP, Dems "Can Work Together"
The toned-down political divisiveness that marked President Barack Obama's State of the Union address continued the morning after, with House Majority Leader, and vocal Obama critic, Rep. Eric Cantor saying that there were "certainly some things we can work on together" to rein in the federal deficit and create more jobs. "The president and I are going to disagree on some things. I think I want to cut spending more than he does. I obviously disagree on the way to put health care in this country. But I did hear the president talk about some things that we can do to create jobs in this country such as simplify the tax code, lower the corporate rate so we can get people back to work, work on these trade deals so we can create more jobs at home. There are certainly some things we can work together on," the Virginia Republican said on CBS' "The Early Show" Wednesday. Mr. Obama broadly outlined his vision for how America could "win the future" by increasing government investment in education, technology and infrastructure. But he also addressed issues like deficit reduction and tax and regulatory reform that may provide an opportunity for bipartisan cooperation. Cantor said that first step should be looking "at things that we can do right away to slash spending." "I think if American families understand we're spending way too much money - much more money than we have. And in order for us to restrain that habit here in Washington, we're going to have to force the budget down." The evening's tone was a stark departure from recent addresses, which were commonly marked by boisterous displays of partisan division. In the wake of the assassination attempt on Rep. Gabrielle Giffords, calls for greater civility in politics resulted in the largely symbolic gesture of Democrats and Republicans crossing the aisle to sit with one another. As "Early Show" co-anchor Erica Hill noted to Cantor, both parties were also united in their failure to specifically address ways to reduce the cost of the country's entitlement programs - social security, Medicare and Medicaid - which eat up 40 percent of the federal budget. Rep. Paul Ryan, R-Wis., delivered the GOP response to Mr. Obama's address. "I think perhaps last night the details of the entitlement situation we face were not brought up. But there's no secret that we have serious fiscal issues long-term in this country. The president has acknowledged that. … And I think most of us have," Cantor said. "I think we all need to sort of come to the recognition, we do have a problem here, and need to begin to approach that in a responsible way." Cantor said that Republicans and Democrats "want to work together" on social security but insisted that Americans 55 and older would not face any benefit reductions. "For those 54 and younger we need to have a serious discussion about what it is for their future that we can do to preserve the system, save social security and Medicare but, at the same time, not allow this country to go bankrupt."